Sam Taylor-Wood (b. March 4, 1967) is an English photographer and filmmaker. She graduated from Goldsmiths College in 1990. Her work is distinguished by an ironic and subversive use of her media. She creates enigmatic, highly charged situations that could go any way and in which any number of things could happen. Taylor-Wood’s work examines the split between being and appearance, often placing her subjects in situations where the line between interior and external sense of self is in conflict. She explores the boundaries between the sacred and the profane, fusing religious imagery informed by Renaissance and Baroque painting with the secular, urban and contemporary landscape that she inhabits. In 1997 she received the Illy Café Prize for Most Promising Young Artist at the Venice Biennale and was nominated for the Turner Prize. In 2002 she was the youngest artist to have a solo show at the Hayward Gallery, London. 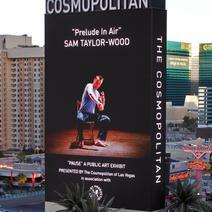 Sam Taylor-Wood has had numerous group and solo exhibitions, including Kunsthalle Zurich (1997), Louisiana Museum of Modern Art, Humlebaek (1997), Hirshhorn Museum and Sculpture Garden, Washington DC (1999), Museo Nacional Centro de Arte Reina Sofia, Madrid (2000), State Russian Museum, St Petersburg (2004), MCA, Moscow (2004), BALTIC, Gateshead (2006), MCA Sydney (2006) MoCA Cleveland (2007) and the Contemporary Art Museum, Houston (2008), Matthew Marks Gallery, New York, and White Cube, London.